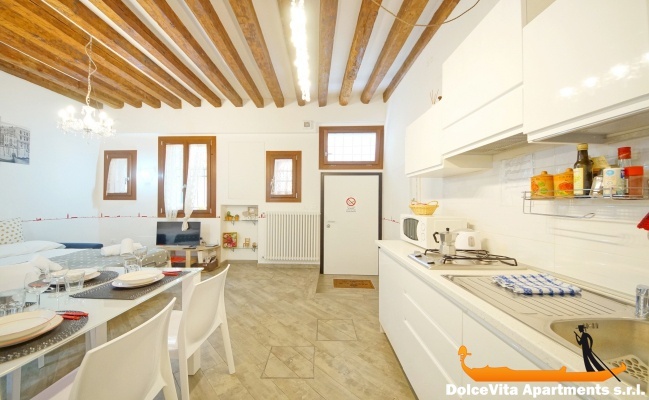 Apartment N. 355: It can accommodate up to 4 people, it is rented from 65 € per Night (not per person). 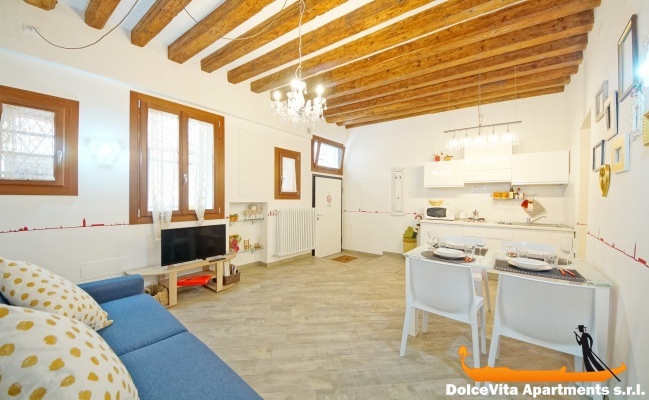 New Venice Apartment for 4 People: This charming, romantic nest, completely renewed in 2016, is ideal to visit Venice’s historical center: close to transport, to vaporettos as well as train station: arriving from the train station you won’t have to cross any bridge and you’ll get home in a few minutes. 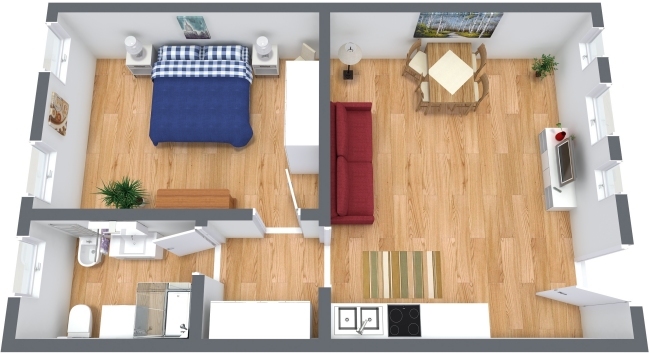 The apartment is on the ground floor with an independent entrance, safe from high water. You will find a wide living room with a queen size sofa bed, a well-equipped kitchenette and a bathroom with window and shower and, last but not the least, the wide romantic master bedroom. Right a few steps from the apartment there is the fruit and vegetable’s market, the fish stalls, several shops and beautiful restaurants; furthermore you’ll be near the Jewish Ghetto. You just have to book! Very nice apartment, well organized, very clean with excellent location. The welcome was super good and we were greeted by a very attentive staff, very attentive and helpful to guide us and show us the best places to visit in Venice. House as described, in excellent condition. To people who like to cook two fires are few but if the goal is to eat out are more than enough. Your service is efficient and satisfactory. Recently refurbished, welcoming and functional in all services, excellent location, it is located a few steps from the train station and the bus to reach the airport. The historic center can be reached on foot in a short time. Mr Rossana is kind and professional at the welcome. 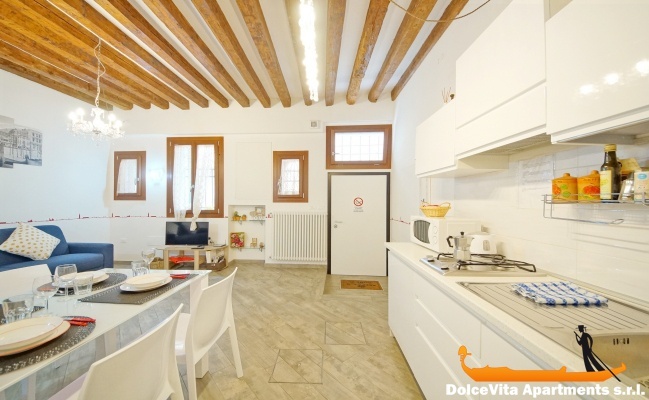 Apartment n355 very cute, ideal for a couple and very well located in Venice close to all amenities. Elisa was adorable, she explained very well and she was very professional. Thank you for your quality service we will return to Venice the stay was perfect. Our too short stay in N.355 apartment was very enjoyable. Everything was as we hoped if not better, with so many unexpected touches of care. The welcome was great, we felt immediately welcome, relaxed and well set. The location is perfect, very close to everything you need but not too plunged into confusion. Cannaregio is a lively, dynamic and genuine neighborhood that gives the visitor a taste of true Venice. Your service is praiseworthy; easy booking and truthful photos and description of the apartment. We felt very well cared for and we were pleasantly pleased. We will return. Great location, fully equipped, clean. 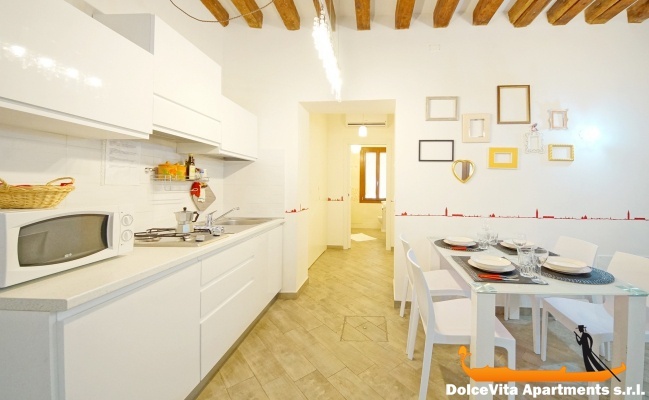 Newly renovated apartment, very cute, comfortable and situated in a great location close to the new road, with all kinds of shops, pharmacies, supermarkets, also in a few minutes you are at the station or in the center, towards Rialto, crossing the Scalzi bridge or Cannaregio bridge.